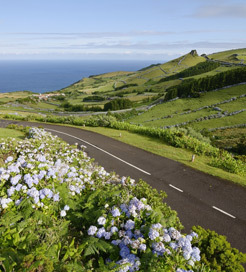 Flores is the westernmost island of the Azores archipelago in the North Atlantic, forming the Western Group alongside Corvo. Listed a UNESCO Biosphere Reserve, Flores is mostly deep valleys blanketed with pink and blue flowers, and etched with deep caves with streams cascading down verdant cliffs; it is arguably the most beautiful island in the Azores. Moreover, between Fajazinha and Faja Grande lies the most scenic stretch of coastline in the island chain, with almost twenty waterfalls reaching three hundred metres high. Featuring seven crater lakes, the island emerged from a sub-aquatic volcano during the Pleistocene period, the most recent ice age, also resulting in many hot springs of sulphurous water. A popular mountaineering destination, Flores offers challenges in the form of Groto de Enxareus, an enormous cavern measuring fifty by twenty-five metres; and, one of the most notable natural landmarks, the Rocha dos Bordoes, a large set of vertical basalt columns resembling a huge pipe organ. Fascinating geological formations also take shape at the Morro dos Frades, where shadows cast by the rocks appear to show a friar and nun, while the offshore Monchique Islet represents the westernmost point of Europe. Flores has many churches, one of the finest being the hilltop Nossa Senhora de Lurdes, affording spectacular views over the island, so it’s worth the climb. The Flores Museum in Santa Cruz provides a fascinating insight into the local agriculture, carpentry and the remains of a nearby shipwreck dated to 1909. Excellent angling opportunities lie all around the coast, and birdwatchers will be pleased to hear it’s the best island in the archipelago for spotting migratory species like goldcrest and the blackcap. The Festival of the Holy Ghost is a centuries-old tradition, which involves enacting the rituals of crowning an 'emperor' and celebrating with a feast and street dancing, occurring on the last Sunday of August in Santa Cruz. In July, the Festival of Emigrant celebrates those who left Flores searching for a better life, but who came back to the island every year, which is not to be missed. Getting the ferry to Flores? Given its westerly location, ferries to Flores only come from the Central and Northern Groups of the Azores, and Corvo, with routes running once a week. Operated by one of the biggest companies in the region, the journey times vary greatly, owing to the sparse nature of the islands. For more information, please visit our Ferries from Faial to Flores page.